Bunny's blog of a journey along the roads and trails of running life. I looked back through some personal history to remember this event in 2013 was my first ever marathon, and that I’ve done it two more times since that first effort. I was shitting myself then, but running a marathon now has become a bit more meh; it’s got more to do with having the right preparation completed in training. Working harder in training makes for an easier event on the day. My preparations had been going fantastically well. 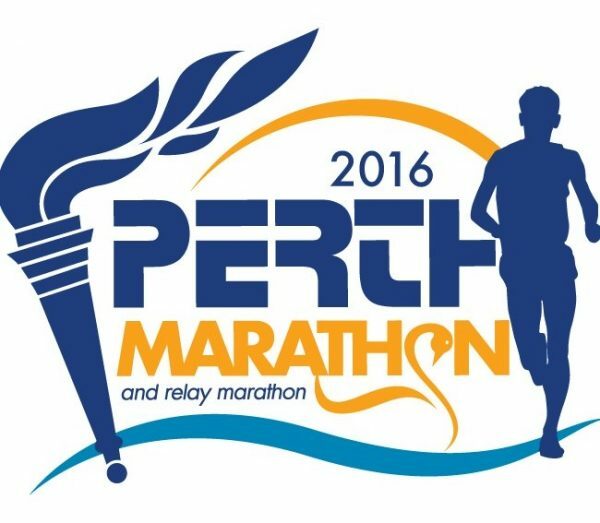 Within a few days of finishing the Australia Day Ultra-marathon after “only” 50km of my 100km target, I wrote a 20 week program to get to the WAMC Perth Marathon. The time flew by with very few interruptions to my training: I hadn’t planned on running the Bunbury Three Waters Running Festival 50km Ultra-marathon but did it anyway and smashed a new personal best, and spent a week with a minor head cold which happily never progressed any further towards my chest and lungs as has happened to me many times before. After Bunbury, I decided that interval training wasn’t doing much for me and that I needed to concentrate more on tempo runs, so I dropped intervals out of my plan and replaced them with a second tempo session for the week. I also (finally) got around to setting up my road-bike on a stationary trainer and did two or three hard sessions each week, leaving large pools of sweat on the garage floor each time as a tribute to my effort. 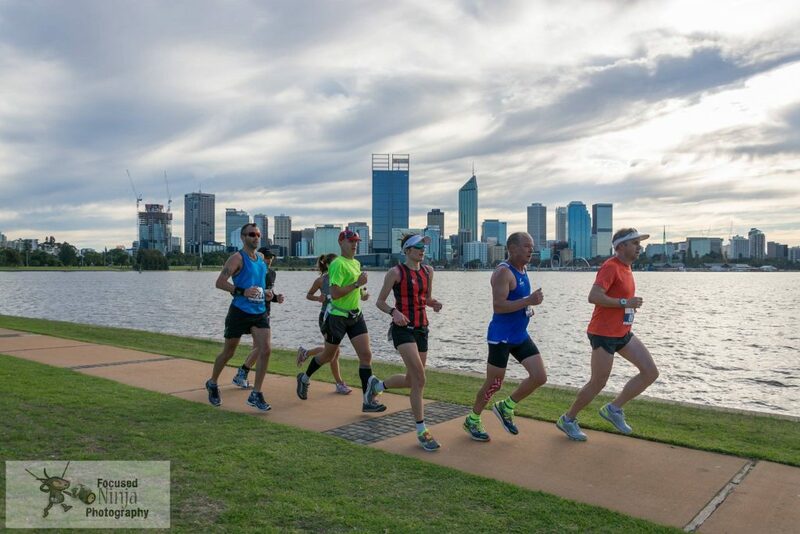 I ran the WAMC 32km event near the end of my training and everything went according to plan; the next week I ran the MAWA 25km event and did even better than I had hoped. My training and build-up were almost perfect, which had me worried that for every day that went by with nothing going wrong, I was one day closer to catastrophe! 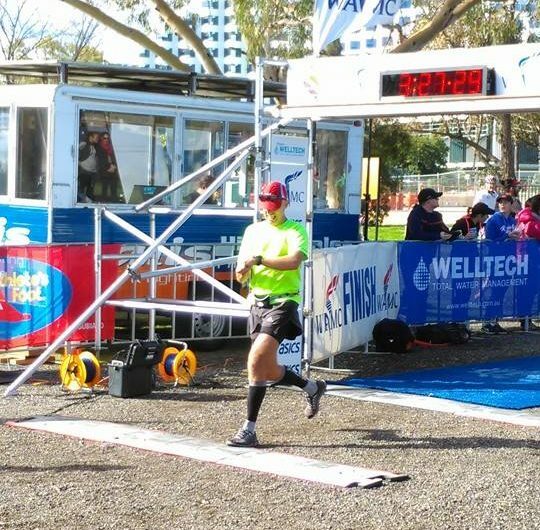 Months prior to this event, a little bird let slip that Australian Olympic champion, Steve Moneghetti, had been for surgery and would pace 3h30m at the Perth Marathon as part of his recovery. It’s not every day that you can say that you went racing with an Olympic Champion, so I was relishing the opportunity to pace off him and have him take me towards a new personal best time. My friend, Michelle, was doing a plan written by Moneghetti which included a workout, “Mona Fartleks”, a hard session of running at lactate threshold pace with short bursts to VO2Max pace; just to up the ante on my own suffering and pay homage to my soon-to-be pacer, I included these in my plan too. Although not precise, to keep the numbers simple in my mind, to complete the marathon in 3:30 means to make the first turn at 0:52, the half distance turn at 1:45 (my PB for the half-marathon is 1:39) and the final turn at 2:38. The weather forecast was for windy conditions, with the possibility of showers and thunderstorms later in the morning (which did not eventuate). The northerly wind was “behind” on the outbound legs, meaning it was in your face on the return, but swirled and switched from time to time and intensified as the morning progressed. It was going to be important to finish quickly today. I hadn’t slept that well on Friday night and rarely sleep brilliantly the night before an event, so was quite pleased to actually have a decent night of rest this time. The alarm woke me up (often I’m awake before it sounds) and went through my normal routines for dressing and final preparations. It was brisk outside but not too cold as I jumped into the car and drove through the still-dark to Burswood. As I was crossing Mount Henry bridge, the sky over the distant Perth hills was a magnificent shade of red, an ominous sign given the Bureau’s forecast rain and thunderstorms later in the morning. I got to the start area in plenty of time and negotiated the parking hassles due to new constructions, grabbed my stuff and wandered up to the WAMC clubrooms. Inside, I had to bite my lip to stop myself giggling, as you could feel the nervous energy of the first-timers permeate through the space; I was once like them but haven’t times changed!? I felt calm, but still I had a cloud of impending doom hanging over my head; things had been just going too well for too long to last. I chatted with a few people, joked and laughed, then went outside to do a bit of a warm up. I came back inside just hear some final instructions from the Race Director and to get ushered out the door again to make our way to the start. I wormed my way towards the front of the runners; there was no way I was going to be starting at the back of the pack today. As something new for this event, WAMC were offering different coloured lanyards for the finishers medals: red for sub-3:00, green for sub-3:30, gold for sub-4:00 and blue for the rest. I desperately wanted the green ribbon, and the colours were going to be based on the “gun” time regardless of individual runners’ net time, so I was going to cross the start line as soon as the gun sounded as I could (without getting caught up in the elite runners, of course!). The first gun fired to send the two wheel-chair athletes on their way, with their lead cyclist (Colin, who I used to serve with in a previous life). The runners pressed forwards and then we were off at the sound of the second gun signal. The 3:30 pace bus had two pacers, Steve Moneghetti and another runner, Paul(? ), who were adorned with their green balloons to make them visible. The plan was for Paul to drive the bus from the front and for Steve to “conduct” from the rear. It seemed like there were hundreds of passengers on this bus; way too many for my liking. Within a few kilometres of the start, the back of the bus over-took the front; the effect on the runners was to mean that people were bumping and fighting for space; it wasn’t aggressive and there was no malice intended, but it wasn’t very pleasant and you couldn’t get into any sort of rhythm. The inevitable happened, twice, with a number of bus-passengers falling over themselves or each other. I’m not too sure whether everyone who fell was able to get up and continue, or whether their months of preparation had been ruined whilst practically still in sight of the start line. Shortly after the second spill, Steve Moneghetti, who was at the front, ducked off for a nature-stop and a few of us decided to use this opportunity to break away and run ahead of the bus. There was maybe eight of us in a group. Two guys either knew each other, or knew of each other, but we were effectively all strangers who all just happened to be running together. Other than the two blokes, there was very little idle chit-chat and this pleased me immensely as I just wanted to run hard and get a good time. The outbound leg from the start was with the wind, so the group ran as a “blob” with little formal organisation as it wasn’t needed. We reached the first turn with one minute in hand on the 3:30 constant pace target. On the return leg, the wind was now in our faces so the group got a little bit organised and people took turns at the front to shield the runners behind from the breeze. On the South Perth side of the river, things got so organised that peleton cycling turns were in full swing ala Tour de France! We made it back to the start and the halfway mark with three minutes in hand. The second outbound leg saw the wind behind us again and our peleton re-formed into a blob again. A couple of runners had fallen off the back but I think we picked up one or two runners from somewhere? I didn’t really care as I focussed on running my own race, with these other people. We were approaching the turn again when the pack-conversation turned to target finish times, one runner said his PB was 3:22, another said 3:20, there were other faster-than-mine times mentioned. I had barely said a word so far in the race as I just concentrated on my breathing and form, so I think I surprised them (everyone?) when I said my personal best 3:44 and I was hoping to hang with these faster runners and for them to take me to sub-3:30. We made the final turn, now with five minutes in hand and started heading back into the wind. I was expecting the group to run like it had before, with runners taking turns at the front to push the wind for those behind. I was in front at the turn, so did the first effort on the front. After a short while, another runner came passed me into the lead so I drafted in behind him and waited for the next runner to come through and take over the lead-runner duties from him, but no-one did. The guy on the front was starting to slow a little from his effort, so I went around him and took over the pacing duty again. After a little while, when no-one had come around me to take over, I looked over my shoulder with the intention to call the drafters to take their turn at the front, but there was no-one behind me! Our group had disintegrated from the turn, everyone had ten to fifteen metres between them and were struggling into the wind on their own. We had run really well as a group, so did I slow down to re-pack the group, or did I keep going at my pace and hope to be able to maintain the pace on my own and not give up the five minutes we had worked so hard to get. I started thinking about my training and the pain and suffering I had put myself through before this day, for this day. I thought about the times I had shouted at Didi that we train for this, and how this is the precise reason we do one more interval in training, or five more minutes during threshold training. I couldn’t let pain be the reason for not achieving my goal, that was just weak thinking, so I forged on at my own pace. Ben had an impeccable build up to this event. He’s ridiculously strong, in body, mind and spirit. His dream was to break the three hour barrier and everything before today said he was highly probable of achieving it. He had done everything right in the months leading into the event, but he said he knew within a few kilometres of the start that today just wasn’t going to be his day. I could see Ben at the ends of the course; he didn’t look comfortable the first time I saw him at the end of the first lap, he was actually closer to us at the end of the second lap when he should have been much further in front, and was only barely ahead as our group made the final turn. I had just made the decision that I was going to run to the finish at my own pace when I looked up to see Ben standing on the side of the course, saluting as I went by (he’s ex-Army so it was an open hand salute, not very naval at all!) I felt so bad for him and started thinking about whether it was actually possible for someone else to sacrifice themselves and absorb my bad luck for me; there was a catastrophe but it didn’t happen to me. I was a little distracted by seeing Ben stopped. I had to focus again, re-group my thoughts and keep pushing into the headwind and to the finish. I started playing scenarios over in my head; what if I lose all the time I had gained, what if the 3:30 pace bus comes by me and could I get on and hang on to the finish, what if…? None of these scenarios had a happy ending, so I kept on pushing, driving to catch up to the runner in front of me, catch a short draft from them and then overtake to hunt down the next runner in front again. Every now and then, one of the fresh-legged relay runners would come thundering by and I’d try to catch a draft if I could, usually to no avail. The final few kilometres of the course were the windiest, but they also the section most populated with spectators and people cheering. I wanted to shout out to them all to stand on the one side of the course and make a “wall” to block the cross-wind, but by this stage I could hardly breathe. I went underneath the Causeway and then only had a few hundred metres to the finish. I could see a few more marathoners ahead and dug deep to chase them down and pass them. With 200 metres to go I passed through the tunnel of noise from the parkrunners and Rogue runners who had established their base camps there. Suddenly, all my thoughts of catastrophe and failure faded as I crossed the line, passing under the timing gantry with its clock showing 3:27 and some seconds. A WAMC volunteer gave me a medal with a green ribbon. Net time: 3:27:13, a PB by almost 18 minutes.